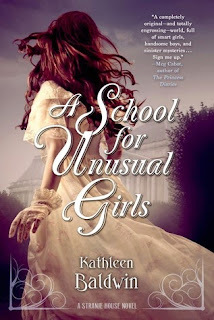 A School For Unusual Girls by Kathleen Baldwin. Tor Teen; 2015. 352 pages. Ebook. A School for Unusual Girls will be released next Tuesday, May 23rd! I was looking forward to this book so much. I even had it listed on my Anticipated Spring 2015 Releases. Sadly, it did not live up to my expectations. "It’s 1814. Napoleon is exiled on Elba. Europe is in shambles. Britain is at war on four fronts. And Stranje House, a School for Unusual Girls, has become one of Regency England’s dark little secrets. The daughters of the beau monde who don't fit high society’s constrictive mold are banished to Stranje House to be reformed into marriageable young ladies. Or so their parents think. In truth, Headmistress Emma Stranje, the original unusual girl, has plans for the young ladies—plans that entangle the girls in the dangerous world of spies, diplomacy, and war. After accidentally setting her father’s stables on fire while performing a scientific experiment, Miss Georgiana Fitzwilliam is sent to Stranje Hous… She plans to escape as soon as possible—until she meets Lord Sebastian Wyatt. Thrust together in a desperate mission to invent a new invisible ink for the English war effort, Georgie and Sebastian must find a way to work together without losing their heads—or their hearts..."
The beginning was equally promising; I was enthralled during the opening chapters, and also so excited that I had found yet another great book. Unfortunately, about halfway through I realized it was not going to continue in such a positive fashion. One of the biggest issues I had with this novel was the pacing. Way too many things happened way too soon with little explanation or reason (I'll get into the lack of explanation after this). As in most books, there is, of course, romance. But this romance happens so fast that I am left holding the book wondering how in the world these two people could so quickly be passionately obsessed with one another. It's one of those "happens at first sight" things, and it is not executed very well. Besides the romance, though, the plot itself just move much too quickly. I felt like I had barely been introduced to characters or plot ideas before something new was thrust upon me. Now, regarding the lack of explanation. There was too much mystery leftover. I can't even tell you exactly what it is that the girls do or how they are able to do the things they do because it's never explained. i'm still confused. There are constant hints and foreshadowing about all the mysteries surrounding the Stranje house and the girls that live there, but they are left completely unanswered, which is extremely frustrated. You know how in some books the author leaves certain things unanswered and it really adds this mysterious and amazing element to the story that just makes it 100x better? Yeah, this is not one of those. On a more positive note, Baldwin does have quite a lovely writing style. There is a nice rhythm to her writing that allows you to keeping turning the pages even though it's not the greatest story. ALong with this, the plot itself is quite imaginative. If executed differently, I feel that this book could have been much, much more enjoyable. The overall idea of having a house for "unfit society girls," who always appear to have some sort of secret, and a major quest for aiding a war is an extremely intriguing prospect. While I am not sure if I will continue the series or not, I do hope that Baldwin can clean up the issues found in this first book for the rest of her releases. A School for Unusual Girls will be receiving three stars. It was enjoyable, I'll give it that, but it just didn't hold up. The plot was loose, the storytelling a bit haphazard and rushed at times. Despite that, as mentioned above, it was still an entertaining read, and thus receives three stars. Also, as mentioned above, this book will be released next Tuesday, May 19th. If you're interested, don't forget to mark your calendars!